Albendazole is often used as adjunctive therapy in the treatment of echinococcal infection to reduce cyst viability before and prevent recurrence after surgical treatment. 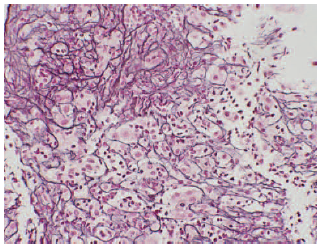 In this report, we present a 38-year-old Iraqi woman with Echinococcus initiated on albendazole therapy who developed acute liver failure 6 weeks after treatment. Investigation for common viral and autoimmune causes of liver injury was unremarkable, and a liver biopsy revealed changes consistent with severe, drug-induced liver injury. Despite discon­tinuation of albendazole, liver function continued to deteriorate, prompting rescue with an orthotopic liver transplant. Often used perioperatively in the management of Echinococcus infection, albendazole can induce idiosyncratic severe liver injury, mandating close monitoring for hepatotoxicity. Echinococcus is a zoonosis caused by metacestodes of Echinococcus granulosus and Echinococcus multilocularis, which results in cystic Echinococcosis and alveolar Echinococcosis.1,2 Cystic Echinococcosis involves the liver with 70% to 80% of disease burden.2,3 Treatment options for cystic Echinococcosis include albendazole, either as monotherapy for small hydatid cysts or as adjuvant therapy with surgery or percutaneous drainage.2,3 While elevation in serum amino­transferases has been previously described with albendazole use, progression to acute liver failure is rare.4,5 To our knowledge, we present the first case of albendazole-induced liver failure requiring a liver transplant. 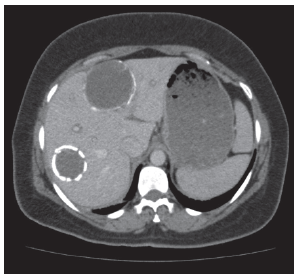 A 38-year-old Iraqi woman with known hydatid cysts presented to the emergency department with a 2-week history of worsening malaise, nausea, fatigue, and jaundice. 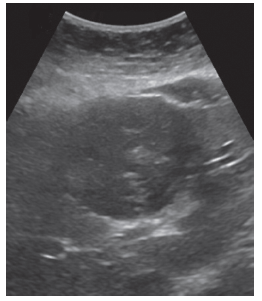 Echinococcus was established 3 months prior, while during work-up for abdominal pain, and ultrasound revealed 2 hydatid cysts measuring 7.4 cm × 6.7 cm and 6.7 cm × 5.2 cm (Figure 1 and Figure 2). Laboratory studies indicated positive echinococcus IgG enzyme-linked immuno­sorbent assay with confirmatory Western blot. The patient was initiated on albendazole 400 mg twice daily and remained well for a month before her presentation to our facility. On presentation, she was found to have abnormal chemistries with elevated aspartate aminotransferase (AST) 1705 IU/L, alanine aminotransferase (ALT) 2118 IU/L, total bilirubin 5.0 mg/dL, and international normalized ratio 1.3. An examination revealed jaundice and scleral icterus, with no asterixis and normal mentation. She was admitted for expedited work-up of acute liver injury and albendazole was discontinued. Over the next 48 hours, her liver function worsened with laboratory results showing AST 2438 IU/L, ALT 2748 IU/L, total bilirubin 12.6 mg/dL, and an international normalized ratio of 1.7. Work-up results for the cause of liver failure including anti-hepatitis A virus IgM, hepatitis B core antibody, anti-hepatitis B core IgM, anti-hepatitis C virus, anti-hepatitis E virus IgM, anti-cytomegalovirus IgM, anti-Epstein-Barr virus IgM, and anti-herpes simplex virus IgM were nonreactive. Antinuclear, anti-mitochondrial, and anti-smooth muscle antibodies were negative, and ceruloplasmin was within normal limits. Duplex sonography showed no abnormality of hepatic vascular inflow and outflow. A transjugular liver biopsy was performed on day 3 (Figure 3) revealing severe acute hepatitis with areas of confluent necrosis, scattered eosinophils, and no plasma cell infiltrates. The patient was initiated on N-acetylcysteine for presumed severe drug-induced liver injury; however, she grew increasingly encephalopathic and required admission to the intensive care unit for intubation and airway protection. Coagulopathy and mentation did not improve on N-acetylcysteine, and the patient was listed Status IA for liver transplant. A suitable donor organ was identified, and she received an orthotopic liver transplant on day 10 of hospitalization. Explant pathology demonstrated massive hepatic necrosis and hydatid cysts with necrotic lamellated membranes. Her posttransplant course was uneventful, and the patient remains in good health with normal liver allograft and neurologic function 1.5 years posttransplant. Clearly, albendazole has a role in the management of Echinococcal infection, either as monotherapy or as an adjunct to percutaneous drainage or surgery. Typically, dosing is between 10 and 15 mg/kg with a usual dose of 400 mg twice daily. Albendazole is hepatically metabolized and documented through case reports to induce hepatitis that often resolves with cessation.11,12 Monitoring typically includes liver function tests and complete blood count bimonthly for the first 3 months, then monthly for the remainder of therapy. In this report, we describe severe acute liver injury that developed after 6 weeks of therapy. The diagnosis of drug-induced liver disease is one of exclusion and usually occurs within the first 6 months of drug initiation. Establishing causality of a drug for a given liver injury is based on expert consensus opinion or causality scales such as the Roussel Uclaf Causality Assessment Method, which correlate agents with toxic liver injury.13 Roussel Uclaf Causality Assessment Method score for this case is calculated at 6, indicating probable albendazole induced hepatitis. When using albendazole treatment for Echino­coccosis, clinicians should be aware of potential liver injury and routine monitoring of liver function tests should be obtained throughout treatment. Continued and progressive liver injury despite discontinuation of therapy may represent evolving liver failure prompting consideration of liver transplant. Rinaldi F, Brunetti E, Neumayr A, Maestri M, Goblirsch S, Tamarozzi F. Cystic Echinococcosis of the liver: A primer for hepatologists. World J Hepatol. 2014;6(5):293-305. Gomez I Gavara C, López-Andújar R, et al. Review of the treatment of liver hydatid cysts. World J Gastroenterol. 2015;21(1):124-131. Brunetti E, Kern P, Vuitton DA; Writing Panel for the WHO-IWGE. Expert consensus for the diagnosis and treatment of cystic and alveolar Echinococcosis in humans. Acta Trop. 2010;114(1):1-16.
el-Mufti M, Kamag A, Ibrahim H, et al. Albendazole therapy of hydatid disease: 2-year follow-up of 40 cases. Ann Trop Med Parasitol. 1993;87(3):241-246. Morris DL, Smith PG. Albendazole in hydatid disease--hepatocellular toxicity. Trans R Soc Trop Med Hyg. 1987;81(2):343-344. Franchi C, Di Vico B, Teggi A. Long-term evaluation of patients with hydatidosis treated with benzimidazole carbamates. Clin Infect Dis. 1999;29(2):304-309. Khuroo MS, Dar MY, Yattoo GN, et al. Percutaneous drainage versus albendazole therapy in hepatic hydatidosis: a prospective, randomized study. Gastroenterology. 1993;104(5):1452-1459. Türkçapar AG, Ersöz S, Güngör C, Aydinuraz K, Yerdel MA, Aras N. Surgical treatment of hepatic hydatidosis combined with perioperative treatment with albendazole. Eur J Surg. 1997;163(12):923-928. Shams-Ul-Bari, Arif SH, Malik AA, Khaja AR, Dass TA, Naikoo ZA. Role of albendazole in the management of hydatid cyst liver. Saudi J Gastroenterol. 2011;17(5):343-347. Arif SH, Shams-Ul-Bari, Wani NA, et al. Albendazole as an adjuvant to the standard surgical management of hydatid cyst liver. Int J Surg. 2008;6(6):448-451. Choi GY, Yang HW, Cho SH, et al. Acute drug-induced hepatitis caused by albendazole. J Korean Med Sci. 2008;23(5):903-905. Benichou C, Danan G, Flahault A. Causality assessment of adverse reactions to drugs--II. An original model for validation of drug causality assessment methods: case reports with positive rechallenge. J Clin Epidemiol. 1993;46(11):1331-1336. Acknowledgements: The authors declare that they have no sources of funding for this study, and they have no conflicts of interest to declare. The authors would like to acknowledge the Banner University Medical Center Phoenix Department of Pathology for providing pathology slides and interpretation. The authors acknowledge that the case was accepted for presentation in abstract form at ACG 2015 Annual Scientific Meeting and Postgraduate Course October 19th, 2015. All authors contributed to the concept, design, and critical revision of the article. Tyler D Aasen, DO, contributed by drafting the manuscript and performed literature search and review. He has read and approves this manuscript. The author has no conflict of interest to report. Laya Nasrollah contributed to the writing, editing, and revising of the manuscript. She has read and approves this manuscript. The author has no conflict of interest to report. Anil Seetharam contributed to writing and critical revision of the manuscript and provided project guidance. He has read and approves this manuscript, and the author has no conflict of interest to report. Informed consent was obtained for this case report.